You’re currently ranked number 2 on Camaro – tell us why you’re having such a fantastic year? Camaro is one of the greatest horses I’ve ever had the privilege to have as a partner. He is a true gentleman and a great athlete, with a huge heart. We have had a super year so far. More impressive than his ranking (we are also sitting on top of the South African league World Cup qualifier rankings) is his consistency. We have an impeccable team, starting with the great Gonda Beatrix, my coach. Chad Cunningham keeps me reaching for excellence between Gonda’s training sessions, and Ian van Schalkwyk who looks after my horses at London Lane stables helps to keep me grounded. Specifically, I believe that a combination of this support coupled with our intensified flatwork, which we have taken back to basics, has helped to maintain our consistency this year. Camaro, for such a big horse, has become much stronger in his deep muscles and more athletic. He is even quicker because of this. I, myself, have been working endlessly on mind ‘focus’, which has always been my weakness, with a sports psychologist. When and why did you move to SA? What do you love so much about our country? I came to South Africa about 9 years ago, from Tanzania, where I lived for almost 20 years, not having seen horses for those years. I was then blessed with two beautiful children. Because of them, we needed more reliable medical care, great schooling, all the amenities to make motherhood a bit less worrisome. I thought I had found paradise when I visited SA for the first time. After two years of living here, I was convinced by a dear friend of mine, to get back on a horse, and that was the beginning of the second chapter of my riding career. As you know, I grew up riding in the United States. I am a native New Yorker. I was fortunate enough to ride with some of our equestrian legends, including George Morris and Nelson Pessoa. My greatest hero, my mentor, was, and still is Norman Dello Joio, one of our Olympic legends. I was Norman’s junior professional rider back in the day, and credit Norman for the rider I am today. It is his humility, and integrity that I try to emulate as a rider, and as a member of the community. South Africa has given me the best of both worlds; the rich African culture in which I have felt so at home, and also the world class showjumping. SA has afforded this older rider a second chance at a dream. 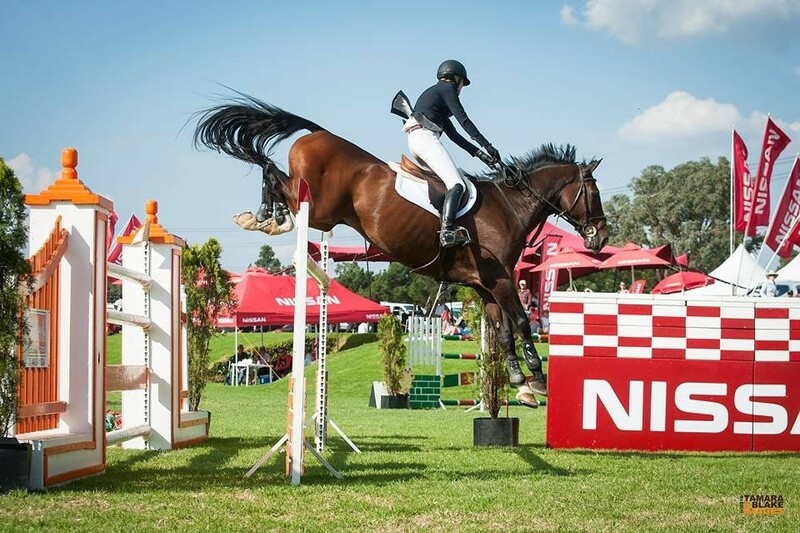 Do you think showjumping in SA is any different to the US – and if so, in what way? It has been a while since I jumped in the States and show jumping is a very different sport now to what it was when I was a young professional. It has been streamlined right from the breeding of these great athletes down to the technicality of the courses we jump. I would say the only difference between the States and here is simply the numbers. The numbers of horses and competitors is significantly more in the USA, as is the prize money. Please remember, however, it is also significantly more expensive there not just to keep a horse, but also to bring a horse to a show – entries, transport, coaching etc. Therefore I do believe we are incredibly fortunate to be here in South Africa. Even if the field is smaller in numbers, the riders and horses could compete at the highest level anywhere in the world. I truly believe this. Tell us about Camaro – his breeding, personality, likes and dislikes. Camaro is a 13 year old Holsteiner, out of the great stallion Carentino. He is a gentle giant, one of the biggest horses, if not the biggest, on the track. He is known to be a massive power jumper, but not built for speed. We are working hard at changing that perception this year, by being very competitive on time, which we were never able to before. As his rider, I hope to help him reach his full potential of achieving number 1 status come year’s end. He is my best friend, my childrens’ favourite ‘pony’ and part of my little family. He has never jumped Derby, however so this is a first. I’m not worried about him, as we will train hard. Gonda and Chad will see that we are fully prepared to walk into that arena, on the day. You attended the riders’ briefing the other night at KPC – what are your thoughts ahead of this years Derby? Since I am relatively new to SA, I have only had the privilege to jump the big Derby once on my great horse Amaretto. Sadly he had an injury and had to be retired a few years ago. I believe in the great legacy of the SA Derby, and this year promises to be the greatest in its history. I believe that it will set a new trend as a highlight of the year not just for equestrians, but for the South African social calendar, much like the Durban July. I am honoured to be a part of this show, and God willing, the big Derby on Sunday!! Will you be joining the after party – do you allow yourself to ‘let your hair down’ and have a good party or are you pretty focused? I’m not much of a partier. I am also a bit older than many in the field – not all though! Hahaha. After the big day, even if we have great success, I will first see that my boy is taken care of before any, if any, festivities take place. What is the biggest challenge for you personally in Derby? I was a good Derby rider, back in the day. I had a great experience on that track with Amaretto, three years ago. As I’m a bit older now, and a mom of young children, I do feel as though I have lost a bit of nerve. Although, I can promise you that on the day, Camaro and I will give it our all!!! Do you hear the crowds when you ride? Does the crowd impact you in any way? When I’m getting ready for the class I can hear everything. I can feel butterflies in my tummy, my thoughts start going to all of the “what ifs”. When the time draws near to walk the course, the outside noise begins to soften. Once I’m on, I hear nothing but the subtle communication between my horse and myself, and Gonda’s voice. Once in the arena, it’s the most peaceful space to be in, when you allow yourself to be fully immersed in your horse’s energy. With the trust and deep connection, you become one entity. There is no greater feeling.